I am currently at page 1221 of Martinez and Tigchelaar’s The Dead Sea Scrolls Study Edition (Martínez, Florentino García and Eibert J. C. Tigchelaar. The Dead Sea Scrolls Study Edition. 2 vols. Grand Rapids: Eerdmans, 2000). Although the study edition is organized well, with the Hebrew on the left page and English on the right, the nature of the scrolls can make the reading a bit tedious. Many of the scrolls are fragmentary and have lacunae. These gaps make it difficult to discern what the author was trying to say. I find myself trying to “fill in the blanks” when words are missing. At first, these attempts to fill in the blanks were serious endeavors. I soon realized that I really had no idea what belonged in those gaps. Filling in the missing words reminded me of “Mad-libs”. When I was a child, my brother and I often took Mad-libs on long trips to pass the time. 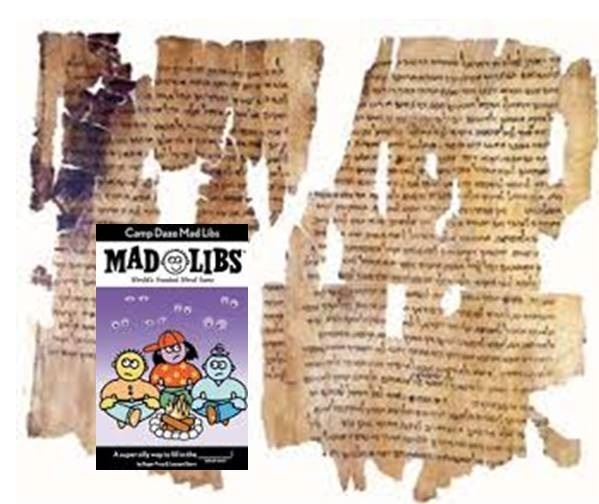 Mad-libs are little booklets that contain stories with missing words (examples at http://www.madlibs.com). The fun happens when someone fills in the blank spaces with random words so that something zany and silly results. Call it unscholarly, but some of the Dead Sea scrolls make great Mad-libs. Try it out for yourself! Fragment 7: [____] on all the offspring of the children of [___] . [____] who shall eat [____} for them around [____] hundred and fifty [____] on [____]. Fragment 11: [____] its four [____] were four cubits high [____] [____] the … near the wall which surrounds [____] its width is two cubits and its height is two cubits [____] and all is pure gold which [____] . [____] of columns, turning from door to door [____] from door to door in the city-wall [____][____] with panels [____]. To browse through pictures of the Dead sea scrolls, visit: http://dss.collections.imj.org.il/.